The elephant tree is likely the most unique plant in the entire Anza-Borrego Desert, and only one such tree stands along this one-mile nature trail. Pick up a pamphlet at the start of this self-guided loop, and enjoy a brief lesson on elephant trees and other more common vegetation. 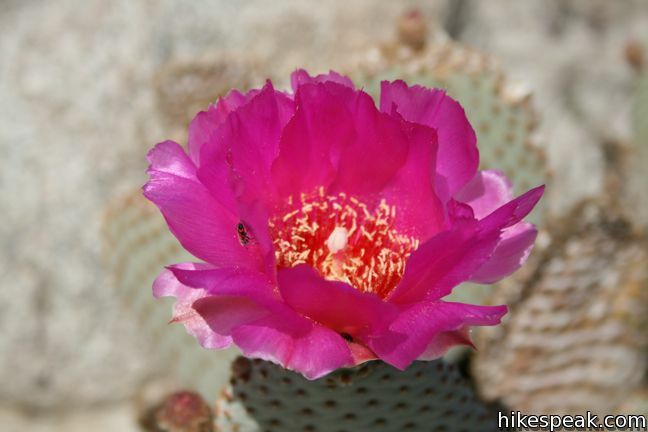 This is a great trail for those interested in learning about plant life in the Anza-Borrego Desert. 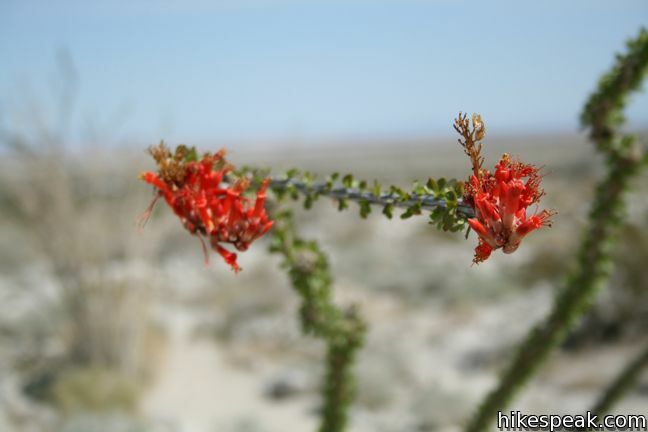 Did you know ocotillo can live to be 200 years old? 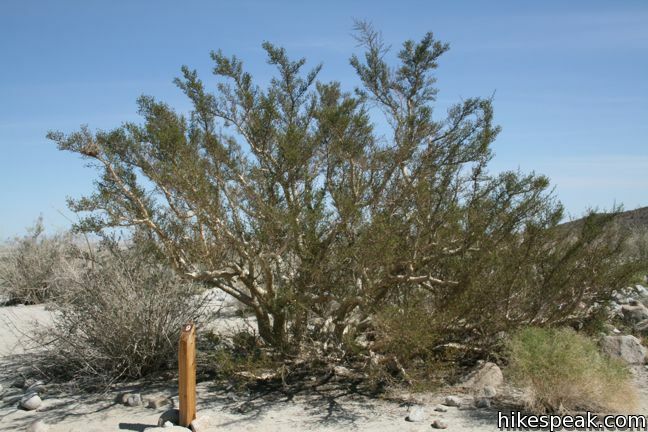 Did you know desert lavender changes its leaves with the season? 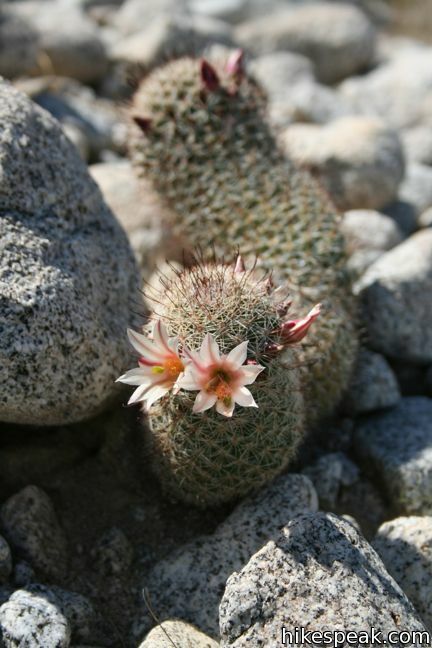 Discover even more about desert plants from readings in the pamphlet that coincide with numbered markers along the way. 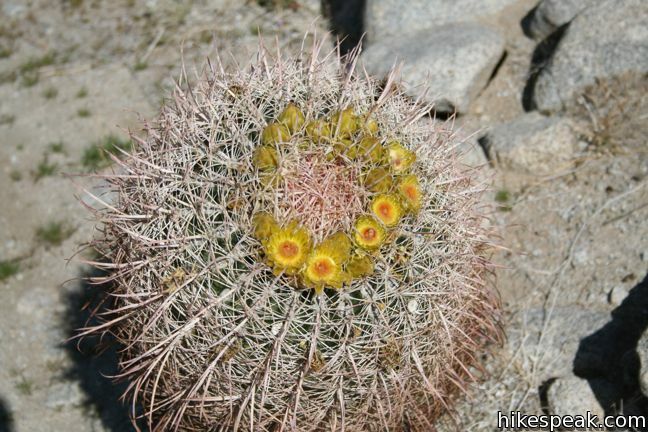 This easy trail circles a level wash with a diversity of desert cacti, brush and trees. Half way around the loop, the botany lesson comes to a climax as you arrive at a sole elephant tree. 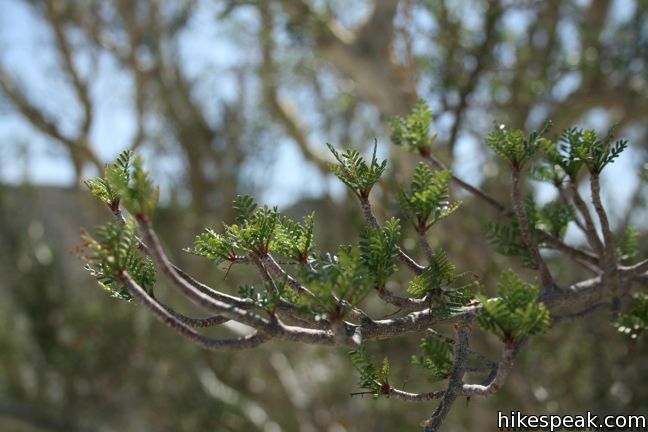 This rare trunky tree with small green leaves grows natively in the Anza-Borrego Desert and areas of Mexico. Scientists first recorded elephant trees at this location in 1937, when over a hundred were growing along Alma Wash. This easy-to-follow trail only has 50 feet of elevation change. 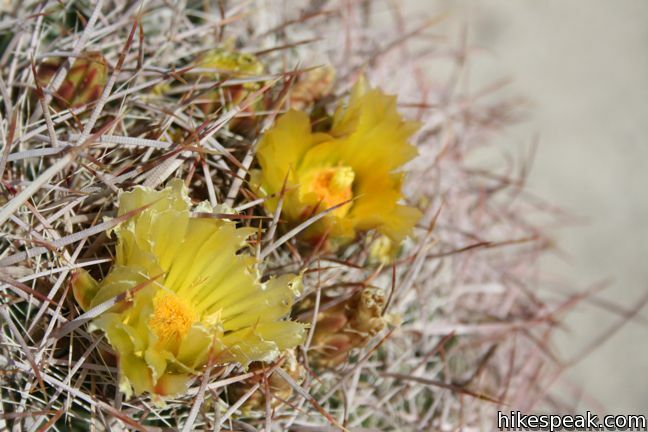 Relax and pay close attention to the sample of desert botany that is present throughout Anza-Borrego Desert State Park. 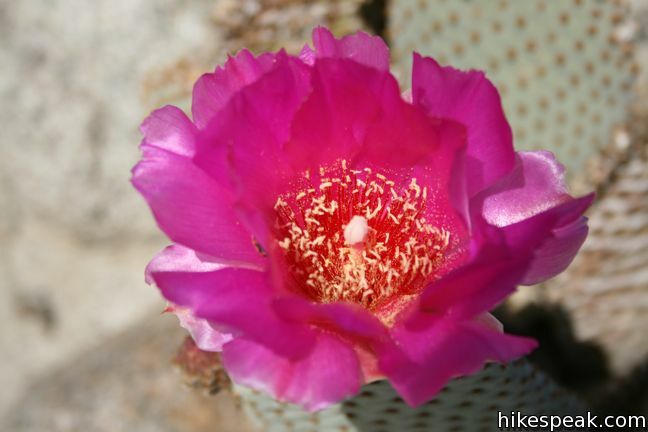 To explore one of the other self-guided nature trail in Anza-Borrego Desert State Park, check out Yaqui Well Trail, Cactus Loop Trail, or Narrows Earth Trail. 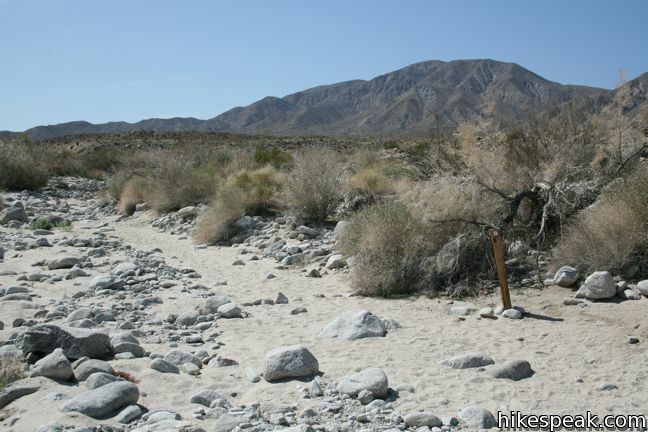 To get to the trailhead: From Christmas Circle in Borrego Springs, drive 11.5 miles southwest on Borrego Springs Road. Turn left on Route 78 East and drive 6.6 miles to Ocotillo Wells in Ocotillo Wells State Vehicular Recreation Area. 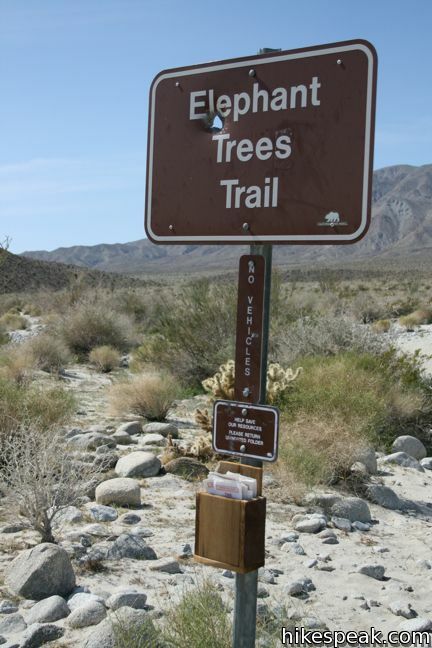 Turn south on Split Mountain Road and drive 5.8 miles to an information panel for the elephant trees. Turn right and drive one mile up a dirt road to the trailhead. The road is rather rocky and low clearance vehicles will have to stop a quarter mile from the trailhead. This 1.25-mile round trip hike climbs 250 feet to a sandstone formation near Elephant Tree Trail that begs to be explored. 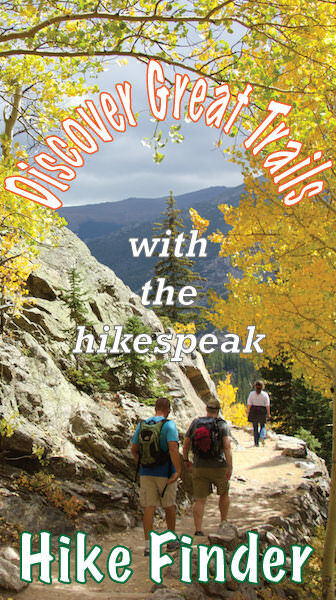 This 0.5-mile self-guided hike explores the geology of the park. Found the trailhead very easily. There was only one trailguide in the box. No map in the trailguide. Found the first 6 markers, but could not find any of the others and lost the trail. Never got to the Elephant Tree and was very disappointed. Be sure to print the map out from the computer before going on the hike. It might give you a better chance of staying on the trail and seeing the tree. Exit off Split Mountain Road and trailhead were easy to find. Two very faded and weathered brochures were in the map box of the trailhead. Found the first seven markers easily, but the the wash area was washed out. We wandered around for awhile then went back to the start and began again going backwards around the trail… This proved to work as we were able to find the remainder of the markers and the Elephant Tree. Very enjoyable walk as well as imnformative. A lot of foot traffic frequents this trail. Trail is marked fairly well with rocks and wood markers. I had no problems locating the elephant tree.